Baan Fan Noi is completely private, with its only immediate neighbour shielded by a thick bamboo hedge. 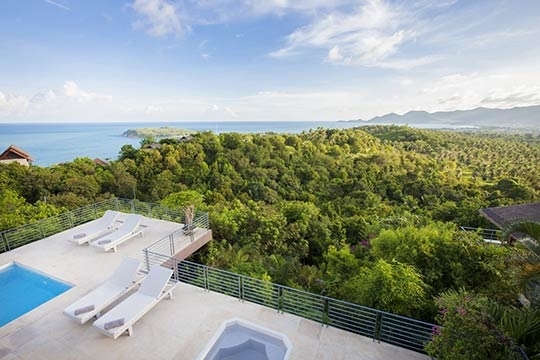 Being set on a hillside means that the tropical forest trees don’t obstruct the villa’s spectacular views, no matter which of the three floors you are on, and birdsong forms the soundtrack to your holiday. The closest road is a few hundred metres below, so there’s little traffic noise. 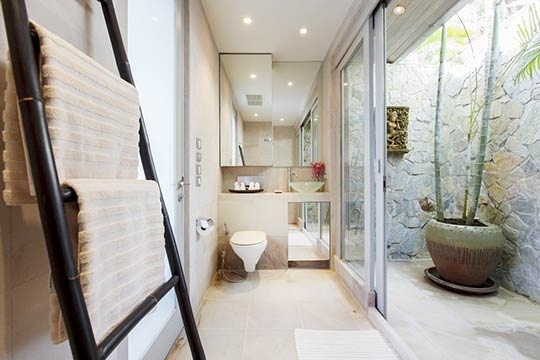 The villa’s neutral interiors, in shades of cream, slate and taupe, plus a collection of Buddha statues indoors and out and some bold flower arrangements, create a peaceful and calming ambiance. 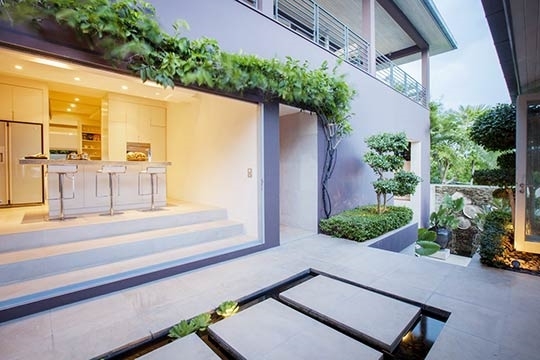 In contrast to this, a rich plum-coloured wall in a pretty courtyard between the kitchen and living area, and enhanced with sculpted greenery, adds a dramatic splash of colour; while clever use of lighting means that the villa can change faces from romantic to party with the flick of a switch. 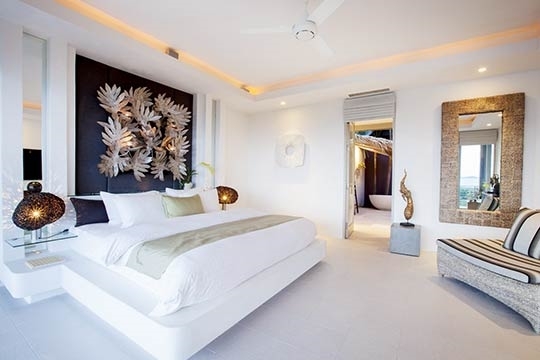 Baan Fan Noi’s location makes it the perfect base for a tranquil getaway yet still offering easy access to nightlife, shopping, dining and beaches. Here, you can escape the crowds and spend a day by the pool, the jacuzzi, or socialising in the indoor or outdoor living spaces. The villa’s split-level design makes it easy to either gather as a group, or retreat for some solitary down time. 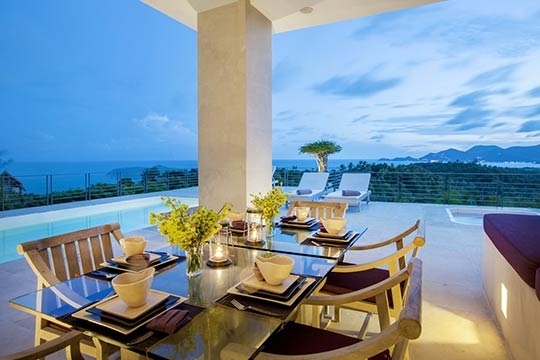 At Baan Fan Noi, guests have the option to self-cater, making for fun sociable evenings of cooking and tasting the local produce (stocking up the bar in the living room to keep the party going), or to hire in the services of a private chef for a bit of indulgence. And if you fancy a night out, Chaweng, with the island’s most popular nightlife spots, is only a couple of kilometres away. 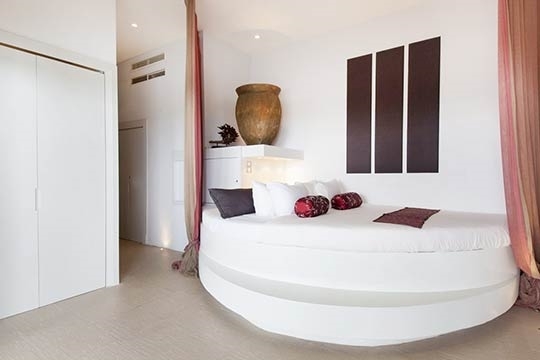 An attentive manager is on hand when needed and a daily housekeeper keeps the villa spotless. If you are self-catering and you’d like your grocery shopping done for you, staff are happy to oblige (a small service fee applies), leaving you free to spend longer in the jacuzzi sipping on a cocktail or two before dinner time. And if the jacuzzi doesn’t do the trick to relieve travel-weary muscles, let the villa manager book you an in-villa massage. 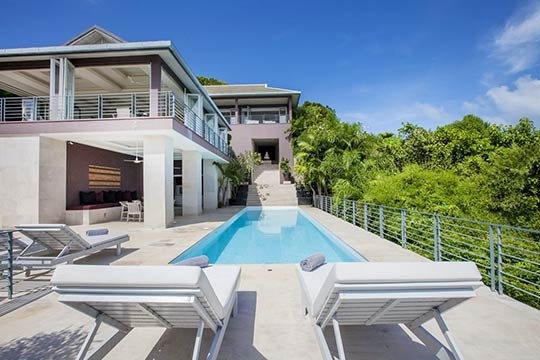 A stylish villa in tropical surroundings with panoramic views, close to town. Although there is another villa to the right of Baan Fan Noi it’s completely private due to the tall bamboo planted between them. 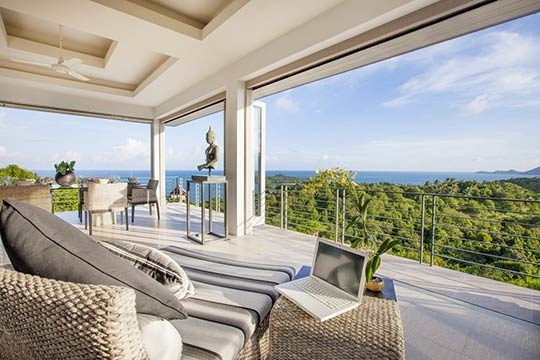 In front and to the left of the villa are swathes of tropical forest, with only the occasional rooftop from a nearby villa or resort peaking through. Beyond the forest, the ocean stretches to the horizon. Although Baan Fan Noi is close to both Chaweng and Choeng Mon, its hillside location means you’ll need a car to get to the restaurants and shops. Chaweng Beach is a bustling blend of holiday indulgences. The options for dining, entertainment and shopping are vast and varied with a five kilometre beach strip lined with stalls selling copy goods and souvenirs, fashion boutiques and shopping centres restaurants, bars, minimarts and pharmacies. Brand name fast food outlets may please the kids, while at night the street comes alive with shoppers and the bars open until the early hours. Although this is perhaps not the idyllic island location some people look for on a holiday in Thailand, the variety of food, products and services on offer makes Chaweng a useful, if somewhat surprising location on an otherwise laid back island and one that most visitors experience at least once during their stay. 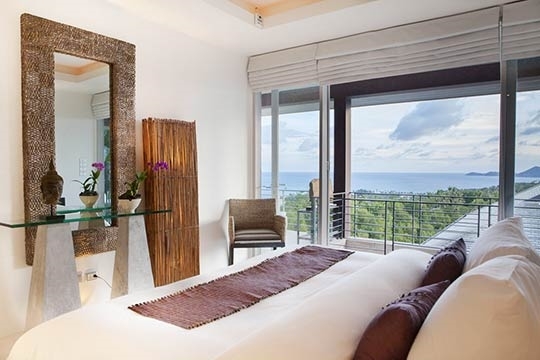 The contemporary Baan Fan Noi flows over three levels, cascading down the hillside above Chaweng bay. 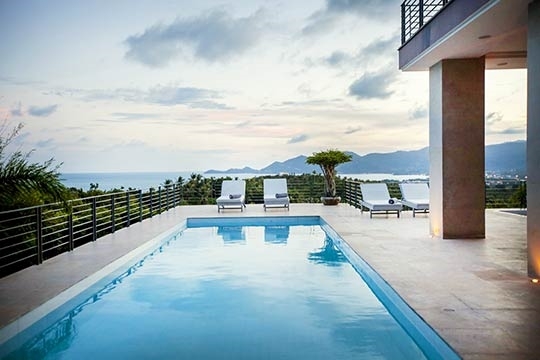 From the entrance courtyard, where guests are greeted by a statue of Buddha, an external staircase, flanked on each side by water features, descends to the villa’s pool terrace and outdoor lounge. 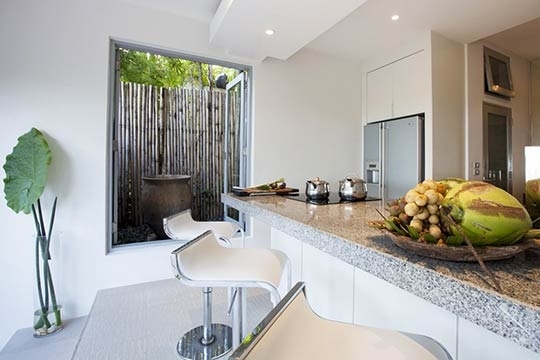 At entrance level are the spacious open-plan living and dining areas and a glossy white fully equipped kitchen with sleek breakfast bar, which is reached via stepping stones over a lily pond set in a peaceful courtyard with built-in daybeds at one end. The living room is bright and breezy – quite literally. 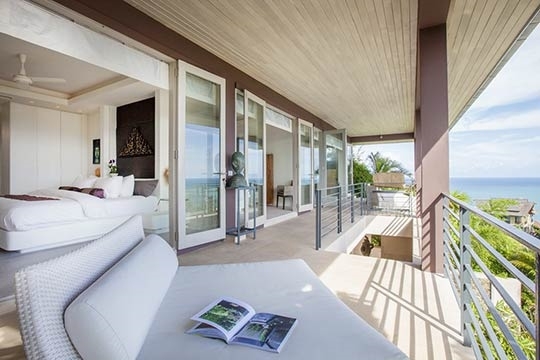 Six ceiling fans cool the room, and stack-away glass doors on three sides allow the fresh ocean air to circulate freely. 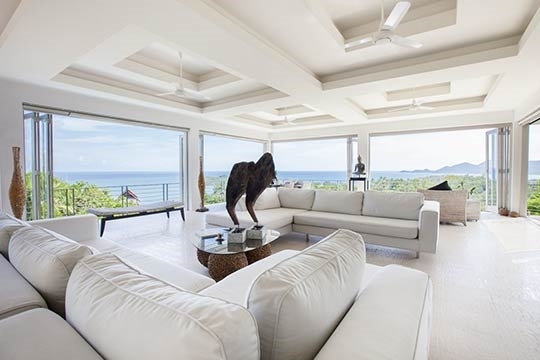 Two large cream corner couches tempt you to lie back, read a book or watch a movie on the wall-mounted plasma screen, and two occasional chairs are carefully positioned to make the most of the forest and ocean panorama stretching out below. 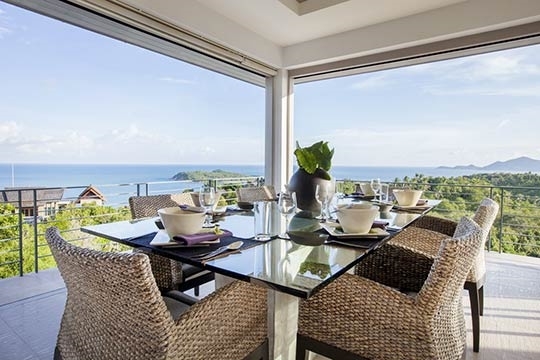 The glass dining table and its sea-grass upholstered chairs are also perfectly positioned for dining-with-a-view. 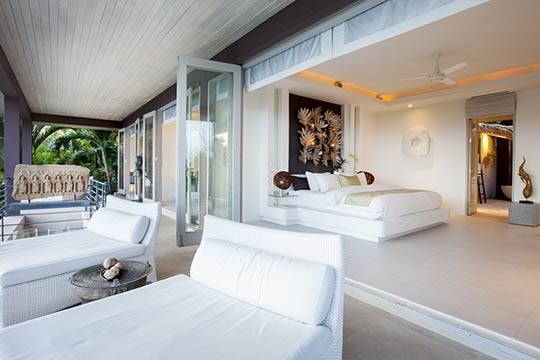 The master bedroom and a further two (slightly smaller) double bedrooms are located on the villa’s uppermost level. 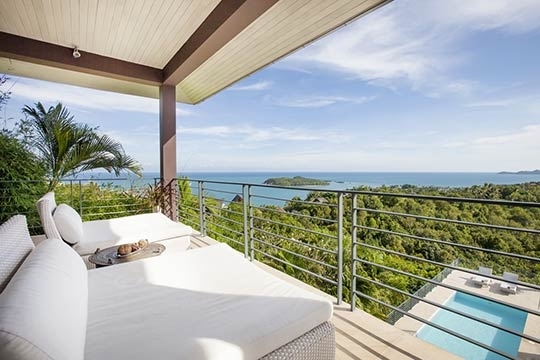 All three bedrooms are furnished with king-size beds and open to a covered balcony decked with comfortable daybeds and offering gorgeous bay views. 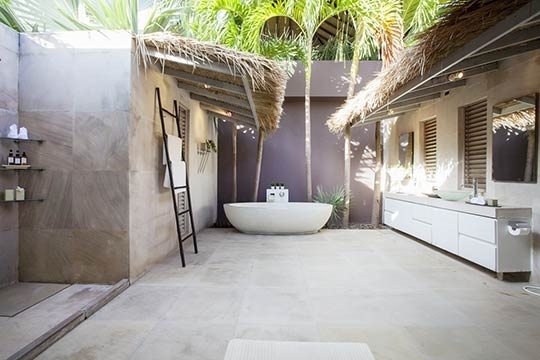 The master suite’s bathroom is completely outdoors, but wide thatched eaves provide protection from the rain. 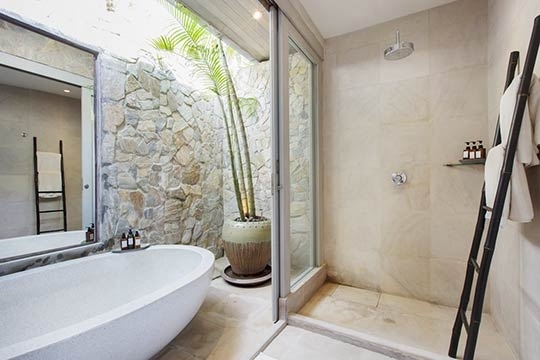 Here, you can laze in the stone bathtub or take a refreshing shower ‘alfresco’. The other two bedrooms on this level have partially outdoor bathrooms; both have rain showers and one has a bathtub. On the lower level is a sandstone terrace complete with a 16m lap-pool, jacuzzi, covered open-air lounge, and the fourth bedroom. 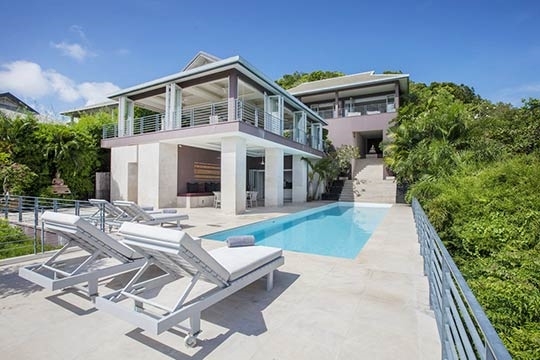 This outdoor living space lends itself to lazy days alongside the pool and social time in the laid-back lounge with built-in couches and a six-seater glass dining table for casual poolside lunches. The bedroom here features an unusual semi-circular bed (roughly queen size), draped with gold and berry curtains that cocoon it for privacy. 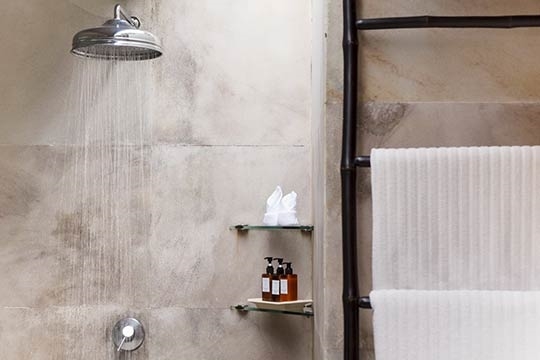 This room’s small ensuite bathroom is fitted with a rain shower. Upon arrival at the villa you are required to pay a security deposit of - . The security deposit will be returned to you prior to departure less any extra charges or costs for accidental damage to the property. The villa accepts payment either by cash or credit card. 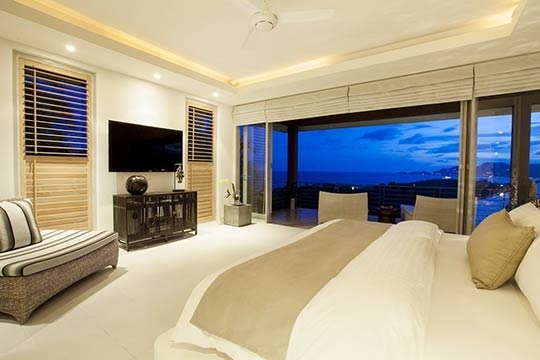 4 bedroom villa located in Chaweng, Koh Samui. Ideal for Beach in ten, Body and soul, Bring the relatives, Going for golf, Fair share for groups, Party pads, Room with a view.